The legions of nanorobotic agents are actually composed of more than 100 million flagellated bacteria Researchers from Polytechnique Montréal, Université de Montréal and McGill University have just achieved a spectacular breakthrough in cancer research. They have developed new nanorobotic agents capable of navigating through the bloodstream to administer a drug with precision by specifically targeting the active cancerous cells of tumours. This way of injecting medication ensures the optimal targeting of a tumour and avoids jeopardizing the integrity of organs and surrounding healthy tissues. As a result, the drug dosage that is highly toxic for the human organism could be significantly reduced. 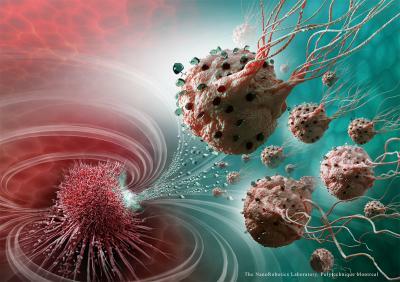 This scientific breakthrough has just been published in the prestigious journal Nature Nanotechnology in an article titled "Magneto-aerotactic bacteria deliver drug-containing nanoliposomes to tumour hypoxic regions." The article notes the results of the research done on mice, which were successfully administered nanorobotic agents into colorectal tumours. "These legions of nanorobotic agents were actually composed of more than 100 million flagellated bacteria - and therefore self-propelled - and loaded with drugs that moved by taking the most direct path between the drug's injection point and the area of the body to cure," explains Professor Sylvain Martel, holder of the Canada Research Chair in Medical Nanorobotics and Director of the Polytechnique Montréal Nanorobotics Laboratory, who heads the research team's work. "The drug's propelling force was enough to travel efficiently and enter deep inside the tumours." When they enter a tumour, the nanorobotic agents can detect in a wholly autonomous fashion the oxygen-depleted tumour areas, known as hypoxic zones, and deliver the drug to them. This hypoxic zone is created by the substantial consumption of oxygen by rapidly proliferative tumour cells. Hypoxic zones are known to be resistant to most therapies, including radiotherapy. But gaining access to tumours by taking paths as minute as a red blood cell and crossing complex physiological micro-environments does not come without challenges. So Professor Martel and his team used nanotechnology to do it. To move around, bacteria used by Professor Martel's team rely on two natural systems. A kind of compass created by the synthesis of a chain of magnetic nanoparticles allows them to move in the direction of a magnetic field, while a sensor measuring oxygen concentration enables them to reach and remain in the tumour's active regions. By harnessing these two transportation systems and by exposing the bacteria to a computer-controlled magnetic field, researchers showed that these bacteria could perfectly replicate artificial nanorobots of the future designed for this kind of task. "This innovative use of nanotransporters will have an impact not only on creating more advanced engineering concepts and original intervention methods, but it also throws the door wide open to the synthesis of new vehicles for therapeutic, imaging and diagnostic agents," Professor Martel adds. "Chemotherapy, which is so toxic for the entire human body, could make use of these natural nanorobots to move drugs directly to the targeted area, eliminating the harmful side effects while also boosting its therapeutic effectiveness." Page took 0.023646 seconds to load.